Yesterday, the line for The Little Mermaid - Ariel's Undersea Adventure was consistently 100 to 120 minutes. We were not thinking of doing it because we wanted to see the parade and Fantasmic over in Disneyland, so we were going to save the wait for today. However, when we went on Toy Story Mania we waited 45 minutes in the regular line and then had to wait extra for the wheelchair vehicle while two groups that had GACs to skip line went around. We did not mind waiting, but the Cast Member gave us a special Fast Pass that could be used on any Disney California Adventure or Disneyland ride except Star Tours. There are not any rides we like going on that had lines longer than 15 mins or different wheelchair access other than Toy Story Mania, which we had just gone on, so we decided to use it to bypass the 2 hour Little Mermaid line. We got on the ride in less than 5 minutes, as even the timing of the wheelchair vehicle coming around worked out with it almost around. 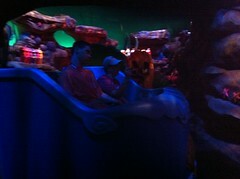 The Little Mermaid's wheelchair vehicle is awesome. It is not a clam shell like the rest of the vehicles, but rather it is like King Triton's chariot. 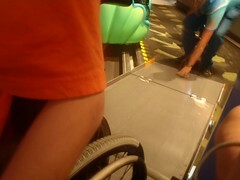 It is designed to have the back fold out to a ramp and roll in with one person riding next to the wheelchair on small seat. 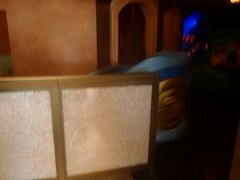 It can be loaded with only slowing the ride, although the Cast Members were not quite efficient yet and had to stop it for a few seconds. The ride itself is pretty good in my opinion. I liked the scene with the sea creatures doing the Under the Sea song. It is interesting how the lighting effects make it like you are going underwater at the beginning and then coming out of the water when Ariel gets her legs. Some may not think it as good as some of the classic dark rides, but it is certainly brighter and it does still tell the story of the movie quite well and Ursula looks rather realistic. Agreed - Ariel looks very real. 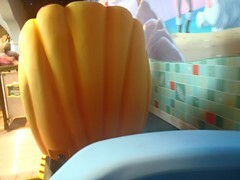 The 'Under the Sea' scene has a 'It's a Small World' look and lighting.